When you invest into advertising/promotion campaigns with The Societies (the world’s fastest growing global association for professional photographers) your message reaches a massive UK and international audience both online and through bi-monthly high-quality print magazines. Professional Imagemaker magazine alone with its 8,000+ circulation, guaranteed direct-mailed free of charge to every member of The Societies at home and across 53 countries, boasts a total pass-on readership estimated in the tens of thousands. 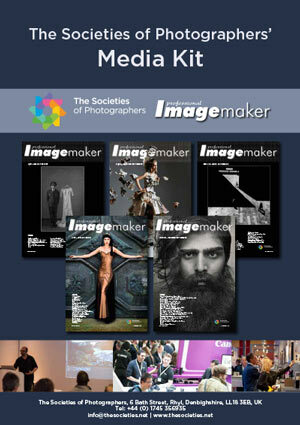 Professional Imagemaker offers professionally crafted ‘inside-track’ features with the world’s top photographers; compelling ‘how-to’ programmes across the full gamut of photo-disciplines; latest imaging product news and services, competitions and constantly updated news on the annual January Convention – the biggest show of its kind in Europe. Other sizes and insert costs by request. Professional Imagemaker has been available in the Appstore for just about a year (released January 2012). The download statistics have been creeping up and show that the readership has been extending into totally new territories including Brazil, Malaysia, China, Russia, Mexico, Portugal, Switzerland, Japan, New Zealand, Singapore, and Taiwan. Professional Imagemaker is perfect bound at A4 size.All measurements are in millimetres (mm). The magazine format is A4, 210 mm wide by 297 mm high. A 3mm bleed should be used on the cropped sides, if known, otherwise around all four edges. Images should be provided at a minimum of 300dpi and saved in either RGB format (Adobe RGB preferred) or CMYK (Coated Fogra 39 preferred);files should be tagged with the relevant icc profile. TIFF file formats are preferred but we will also accept JPEGs. Paths and Alpha channels should be deleted, unless they are specifically required. eg, cut out a camera. Text may be supplied in any standard format (MS Word, .txt, or RTF formats). Passages of text should not be supplied within an email but as an attached file. Text for inclusion as editorial matter should never be supplied in PDF format. The preferred format is press-ready, PDF files, see below. Images, background colours and fills that are intended to extend to the edge of the page, must be supplied with a 3mm bleed on all edges. Crop marks should be included. Text boxes and other ‘live matter’should sit 5mm in-board from the outer edges of the page. The inner gutters to the magazine are set at 15mm and for ease of reading, live matter closer than this to the spine should be avoided. Please also ensure that any fonts used are legitimate copies and not protected. If you are unsure convert the text to outlines. Professional Imagemaker works to the ‘pass4press’ protocols of the Periodical Publishers Association and only files made to that standard (including the correct transparency flatteners) are assured of safe passage through to print. The pass4press methods are available, free of charge, at http://www.ppa.co.uk/all-about-magazines/production/pass4press/. The instructions are simple to follow and are recipe-based for the major page layout programs. Please note that spot colours should be converted to CMYK. Submitted adverts should be named according to best practice (ie do not use any illegal characters in your file name) and should include the name of the advertising company not ‘Professional Imagemaker’, ‘Imagemaker’, ‘SWPP advert’ or the like – we already receive a number of those each issue and they can be mixed up. File extensions should be included when saving from Macintosh operating systems. If you refer to Professional Imagemaker, The Societies or the Convention in your advertising matter, please use the spellings here. Good luck, our objective is to present your material in the best possible manner to the highest possible standards of reproduction! Keep our readers up to date with the latest news from the photography industry. The news section on our website (www.swpp.co.uk/news) is becoming a major resource for photographers to find out what’s happening in the industry. Please email ben@thesocieties.net with any news items.